The Steelers beat another undefeated team this week, their interstate "rivals" the Philadelphia Eagles. I say "rivals" because the two teams rarely meet. Ben Roethlisberger had another great day. The Steeler defense had another great day, holding the Eagles to only 23 yards rushing and 111 yards of total offense. The Eagles average around 370 yards of offense per game, but it was the Steeler rushing attack - 252 yards - and a tempered, considerate passing game (183 yards) that put the Eagles down for the count and early. 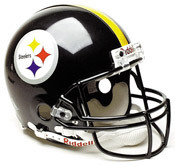 Once again the offensive and defensive lines dominated the line of scrimmage, and the Steeler time of possession (nearly 42 minutes) again greatly overshadowed that of the opponents. TO was silenced (and a few Steelers mimicked the Eagles celebration). People say it every game: you don't want to see TO dance, keep him out of the end zone. The Steelers kept every Eagle out of the end zone today. I'll write more tomorrow. I'm on my way to Pittsburgh to see R.E.M. P.S. Very classy when, after reaching the Eagles 8-yard line with 2:30 left, the Steelers kneeled instead of going for a TD or field goal. Update: I don't have much more to add. The score, the stats, the record (the Steelers are the only team in the NFL to ever beat unbeaten opponents in two straight weeks past week six), the record (7-1, the "-1" coming with Tommy Maddox as the starter)… they speak for themselves. One Response to "Eagles 3, Steelers 27"
Thats amusing, I am here (pittsburgh) to see Bob Dylan.